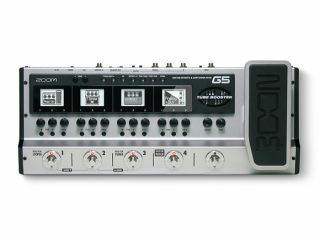 Zoom's G5: effects and amps in a pedalboard. NAMM 2012: Zoom's latest release is the G5 guitar effects and amp simulator, which offers some 120 effects including 20 amp models. You can use up to nine effects at a time and there's a tube booster for amp overdrive. Amp and stompbox interfaces are displayed on the four LCD displays. No word yet on pricing or a release date stay tuned to the Zoom website for more.